Welcome to A Welder's Mate. 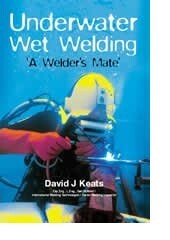 The only book currently available, purposely written, by a commercial welder-diver, as a training aid for those interested in underwater wet-welding. The book contains step by step guidelines and procedures for performing underwater wet-stick welding and will aid all those seeking a full and detailed understanding of all the parameters involved in wet-welding. It includes many chapters connected to all the principles of MMA welding, including welding plant and equipment, consumables, terminology, process characteristics, welding procedures and qualifications, metallurgy, iron and steel, weldability, defects, H&S and comes with a set training exercises to help you practice the necessary welding techniques, together with a mock exam paper to see what you have learnt. It contains over 300 pages, with over 200 illustrations/photos and is packed full of useful and easy to follow tips on successful welding. It takes you from the early history and my 'case' for wet welding, right through to mock examination questions. A case for wet welding, describes the benefits of the process and how it can be performed to high quality standards. Principles of operation, describes how the process works and the functions of key components. Basic techniques, describes the best method for operation, the different techniques available and also the control difficulties to weld underwater. If you are interested in improving, or extending your knowledge of underwater welding, then you'll will find this book an invaluable sorce of reference. All payments made through PayPal are conducted securely. Just click on the relevant button to make your purchase, which includes postage and packing.